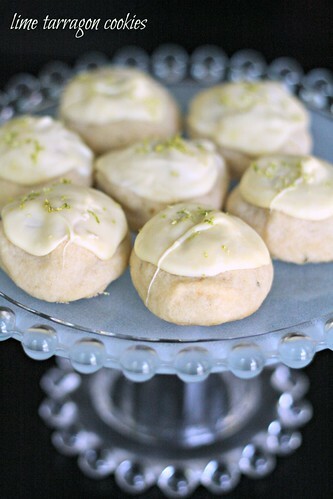 This week's Baked Sunday Mornings recipe was for Lime Tarragon Cookies with White Chocolate Lime Topping from . You can view the recipe HERE. I've never really dabbled with herbs in my baking before, other than lavender. And I've never ever used fresh tarragon in ANYTHING. In fact, I had to visit four different grocery stores in my area before I found fresh tarragon. Fresh tarragon leaves don't really have a smell, but once you cut into them there is quite a strong licorice/anise scent. I was worried this would overpower the flavor in the cookies. However, I made the dough according to the recipe and tasted it (I LOVE cookie dough), and there was just a hint of the tarragon taste, enough to compliment the lime flavor without overpowering it. I finely minced the tarragon so that it was distributed pretty evenly throughout the dough. I'm not sure if I'd make these again, unless I had another use for the tarragon or grew my own...I ended up using only about one-eighth of the plant and tossing the rest. See what other bakers thought of this recipe HERE. Recipe: Lime Tarragon Cookies with White Chocolate Lime Topping from Baked Elements: Our 10 Favorite Ingredients by Matt Lewis and Renato Poliafito.